It is that time of year again where it seems like everyone starts getting sick. Sniffles, coughs, runny noses, and body aches are no fun at all. Luckily, we can give our immune system a slight boost through the foods we consume. 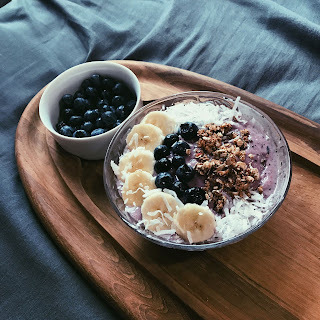 Whether you want to prevent sickness, or you are already feeling sick and trying to get over it, this smoothie bowl recipe is for you. I like to have it as a nice breakfast to nourish my body with healthy ingredients right away! It is filled with nutrient-dense and anti-oxidant rich foods to ward off winter bugs. Blueberries are one of the best sources of antioxidants, which fight free radicals that cause sickness and cell damage. They are also high in vitamin C, which some studies say fights against colds and sicknesses. You can buy some fresh at the store, or just buy pre-frozen berries. Make sure they are brown-spotted and ripe! Chop the bananas the night before and place them in a plastic bag to freeze overnight. Bananas are another fruit high in vitamin C . They also contain nutrients such as potassium which protects the heart and can ease muscle soreness. Cinnamon is anti-inflammatory which helps with muscle pain, aging, and allergies. It is also another anti-oxidant rich food to combat free radicals and germs. Chia seeds are quickly gaining a super-food reputation, and for good reason! 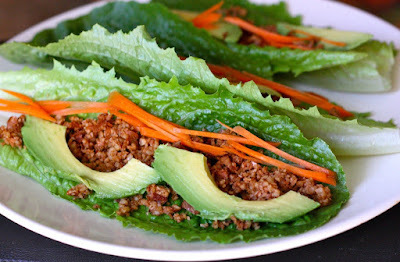 They are packed with iron, calcium, protein, fiber, and omega-3 fatty acids. Omega-3 is a nutrient that many people are lacking, so it is important to add more into our diets. Omega-3s boost brain function and curb inflammation of the blood vessels to prevent heart disease. Coconut and walnuts are good sources of zinc, a necessary mineral that we often lack. Zinc is essential for strengthening the immune system. They also have high contents of iron, which helps transport oxygen through our blood and makes us feel less fatigued. Coconut and walnuts are sources of healthy fats which help transport vitamins through the body. Vitamins such as vitamin A, D, and K, are fat soluble, meaning the body does not properly absorb their benefits unless they are eating with a source of fat. This will be used to help blend your ingredients. You can also use coconut water if you are not a fan of non-dairy milks. Add frozen blueberries, frozen bananas, cinnamon, and chia seeds to your blender. Add just a few tablespoons of non-dairy milk and begin to blend. Add more liquid as needed, but try to keep the texture thick and creamy. I like to pause the blender every so often and use a spatula to stir everything around and blend again. Once everything is blended into a good consistency, pour your smoothie into a bowl and top with shredded coconut, walnuts, and more fruits. I topped mine with fresh berries and chopped bananas. Enjoy! Feel free to add more or less of each ingredient to satisfy your taste buds! I sometimes like to add protein powder, cacao, or dates to this recipe for an extra kick.